Eating enough fruits and vegetables in your daily diet can be challenging. However, making sure you get plenty of fresh produce is important. When you’re living with chronic pain or conditions that cause inflammation, eating the right foods becomes even more important. If you’re tired of eating fruit and vegetables the old-fashioned way, consider juicing for pain relief. Certain foods may actually help combat chronic inflammation and pain. These foods are often rich in antioxidants, polyphenols as well as vitamins and minerals. Many people find it difficult to eat enough fruits and vegetables. 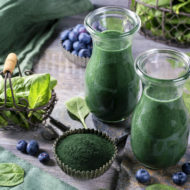 Juicing allows you to drink fruit and vegetable juices, so you may receive the benefits of these excellent foods a little easier. Pineapple is packed with pain-fighting nutrients. 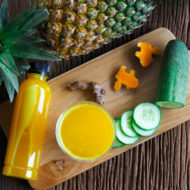 In fact, pineapple contains bromelain, which is an enzyme that has shown promise in aiding digestion, fighting cancer and promoting better whole body health. Bromelain may also help reduce inflammation, which could also help reduce pain levels. In addition, turmeric is a well-known anti-inflammatory. Combined with turmeric and dash of cinnamon, this pineapple juice recipe packs a punch of tasty benefits. Juice the pineapple, cucumber and fresh turmeric. Stir in the cinnamon and enjoy!